Hi there, how are you doing? I hope you have had a good couple of weeks. Mine have as ever been very busy, with plenty going on. So it was my birthday on the tenth of December. Thanks very much for all the nice messages I received on the day. I have to confess this huge annual event is something I do like to celebrate with at least a couple of different gatherings. On the day itself I just went down my local pub for a couple of drinks with a few mates in the evening. It was great to catch up with everyone and we did have a good old fashioned laugh. Although I did somehow manage to knock over a whole pint. When I managed to catch it with my bottom. I am still not exactly sure how this occurred, as I am not exactly Kim Kardashian in that department. 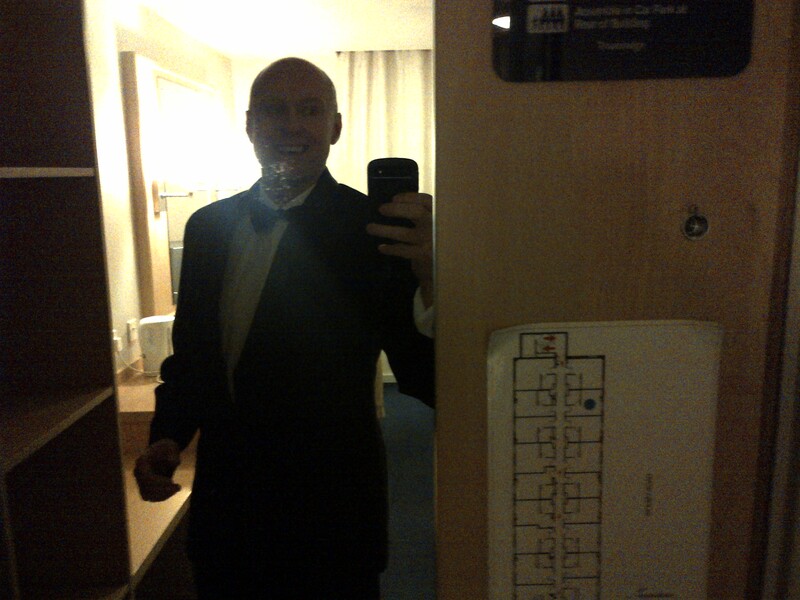 But it did not spoil what was a brilliant night, despite me having to do a bit of mopping. As I have already stated I never knowingly under celebrate the occasion of being born. So on the following Saturday after my birthday I then went out in London with a few friends. It was another top night out. We went to a combination of my favourite bars in the capital, mixed in with a few places that I had always wanted to go to. But had not got round to, including the Radio Rooftop Bar. 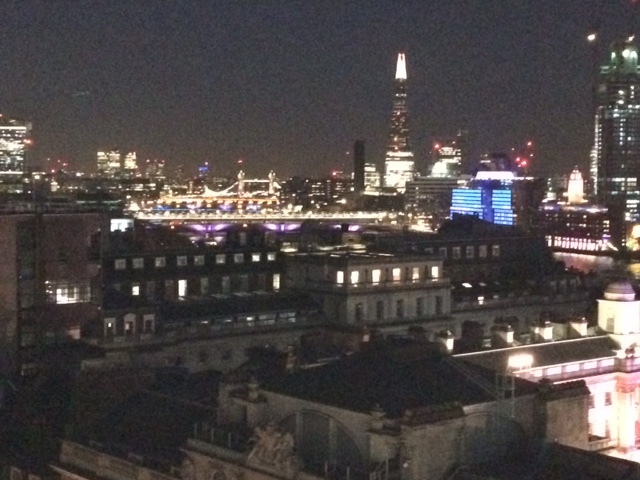 I have to confess I do like a bar with good views over London. And as the name suggests this one very much falls in to that category. It is the set piece bar of the ME London Hotel on the Strand, just near the Covent Garden theatre district. So it would be a great place to visit for a pre show drink in my opinion. 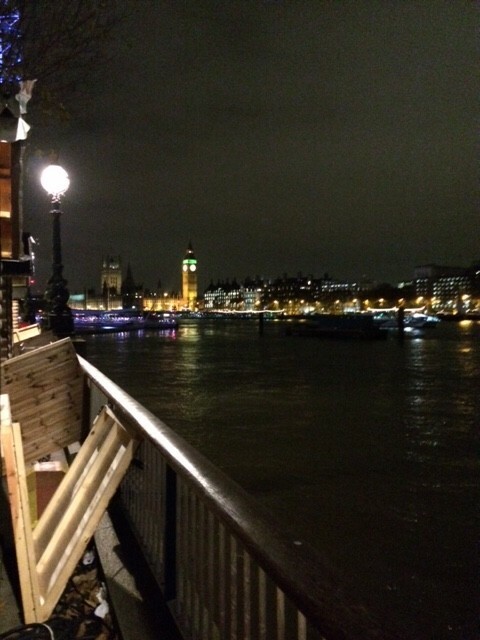 It is a very stylish bar, with friendly staff, a nice selection of drinks and stunning views over London. I was in there just as it was getting dark, so when I went and had a look out on the terrace everything was lit up and you could see a lot of the big tourist attractions very clearly, it looked amazing. I was once again back at Elstree Studios the other week to see a recording of the Christmas Day and New Years Eve Top of The Pops specials. I do not think I am giving too much away by saying this. I am pretty sure everybody realises it is not live and that all the bands and people have not chosen to spend the day together in this way. To give you some idea how difficult the logistics of organising all the acts and giving them the relevant recording time is. I can tell you it was filmed in four separate parts over two days. So when you sit down to watch it there will be four different audiences featured on the programme, with it cutting between them as they move from song to song. So bearing this in mind the bit I saw featured performances from three different artists. The first performance was from the great George Ezra. Now as this was for the New Years Eve Show the production staff handed out New Years Eve hats. 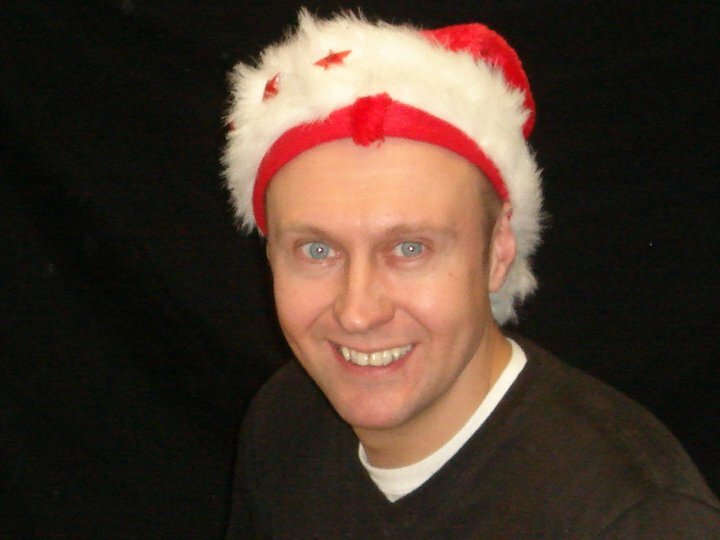 They then run through the song twice, so they can record lots of different camera angles, then pick the best ones in the edit.Then we moved on to the Christmas Show, so had to change in to Christmas hats before seeing Professor Green perform his song twice next. Then we had Tom Odell on to do his current song, you know the one. The song from the John Lewis advert featuring the penguins. He ended up doing this three times, with him on the piano while being backed by a full strings section. Lastly George Ezra came back out to record “Budapest” for the Christmas Show. All the acts were great and so consistent. Every performance was a complete replica of one previous. In between the live music elements the brilliant Fearne Cotton and Reggie Yates were there recording their links to the camera. They to had to start out in their New Years Eve outfits then change in to the Christmas clothes to correspond with which one of the two shows we were currently filming. 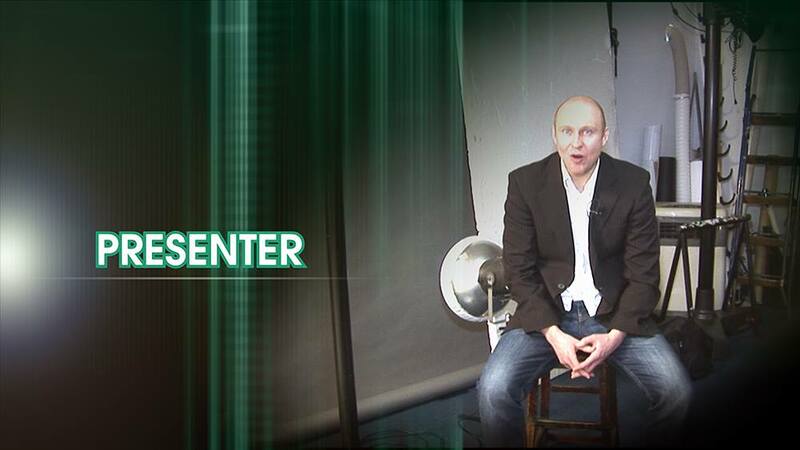 Complicated business this TV stuff you know. They were so good, really on it, and virtually one take wonders with no auto cue. They were learning the bits first, just before delivering them. A nice presenting master class from the both of them. 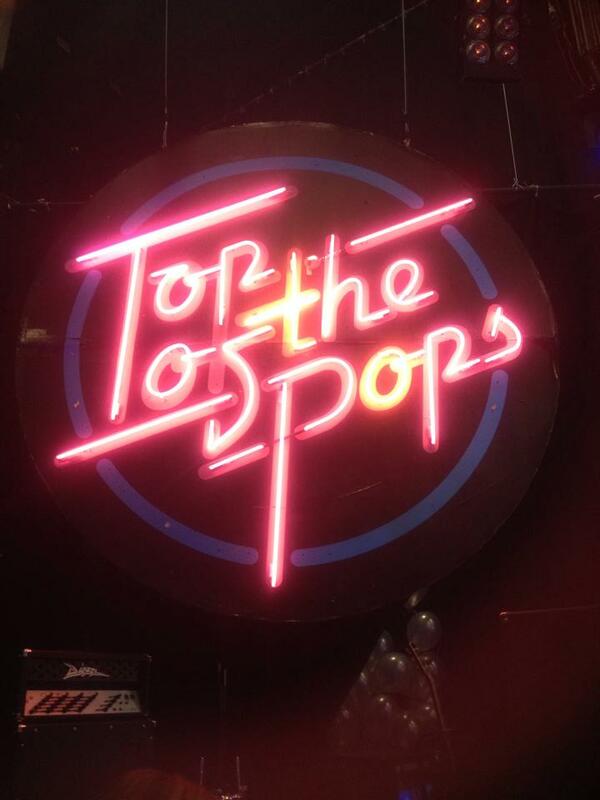 It was weird but great being in the famous Top of The Pops studio. A quick mention for Danny the warm up man stroke head of motivation and stage direction. He did a great job keeping the energy up and things moving along nicely. It was a great fun afternoon out. 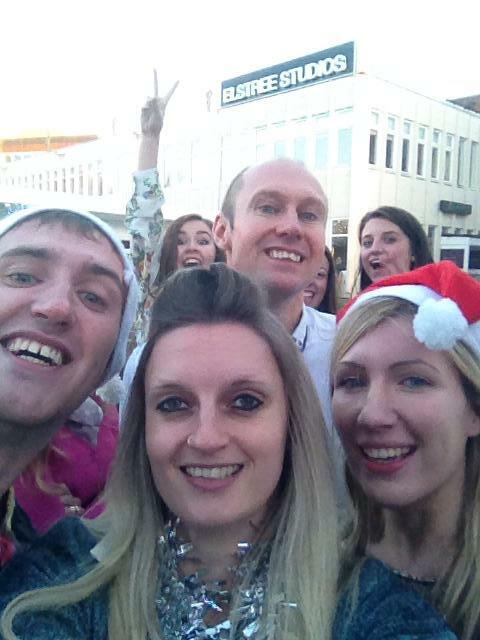 Which now means you can all play the can we spot Neil on television on Christmas Day game. To help you out a bit I will be the one dancing, just out of time with the rest! With it being the run up to Christmas I have like everyone else been out quite a bit for food and drinks, with lots of different groups of people. 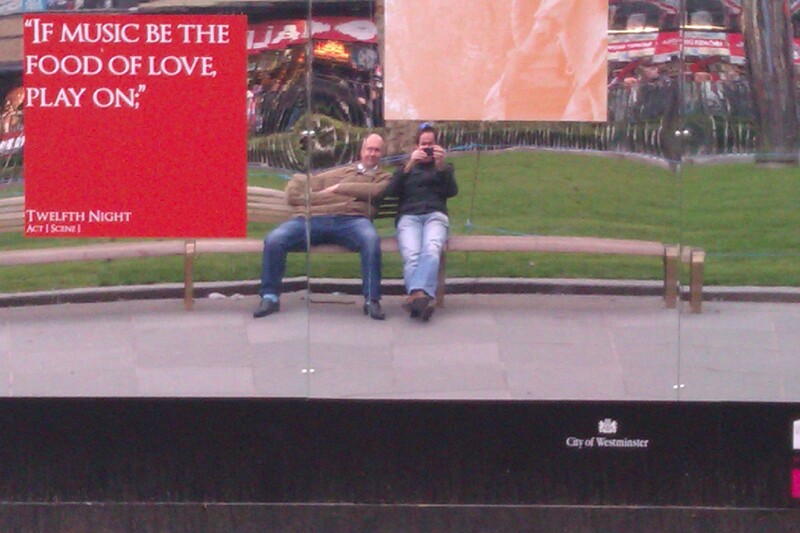 I had a really nice catch up with a former work colleague at Giraffe on the South Bank in London. Decent meal with great company and conversation. I arrived at the restaurant a little early so had a bit of walk around first and discovered a German style log cabin pop up market. Which seem to be everywhere at the moment. It was a chilly night and it felt quite festive so I treated myself to my first glass of mulled wine of the year, from one of the stalls. Which tasted good and certainly left me with a bit of warm glow. I have also been out for a few seasonal drinks at my favourite pub in London, with some work associates. It is Waxy O’Connor’s just off Leicester Square. A place I have been going for around eighteen years now. In my opinion not only does it serve the best Guinness in England, but there is always a great atmosphere in there. The music is good and I really do feel very at home there. If I am in London and have some spare time, there is always a good chance you might find me in there having a pint. So another series of I’m A Celebrity Get Me Out Of Here has been and gone. I really enjoyed this year’s show. I liked the fact that most of this year’s camp mates got on with each other and had a good laugh. I would much rather watch people interacting in this way than shouting and screaming at each other. I appreciate that there was a small amount of this that went on. But on the whole it was like an antipodean Hi De Hi. 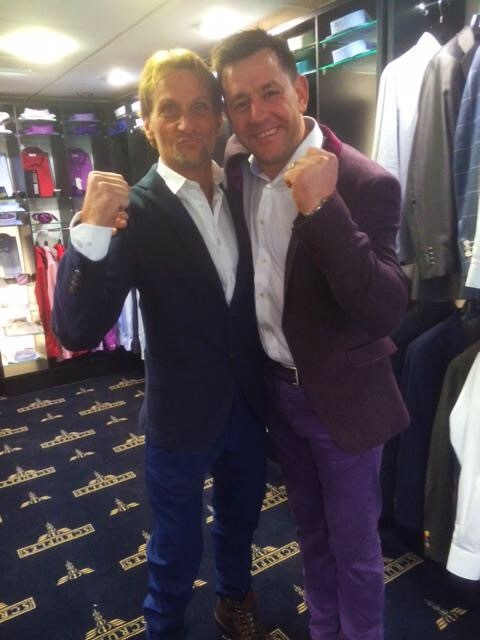 Huge congratulations to Carl Fogarty on winning the competition and being crowned the new king of the jungle. I am very pleased for him. Not only because I have met him and he is a top bloke. What you see it was you get. He his nice, polite, funny, tough and humble. But I am also very pleased he won because he was the person I tipped right from the start to walk away with the title. I thought he came across as a lot of fun and just very real. He has been busy since he has been back in England handing out awards at the BBC Sports Personality of The Year Awards and The British Comedy Awards. Due to his success in the world of motorbike racing, he always signed his autograph with a number one on the end of it. And after this recent success he can of course continue that tradition. Nice one Foggy, well done mate! I have always loved the Royal Variety Show and although I have never been to the theatre to see it in person. I have watched nearly all of them when they have been shown on television. I am a massive fan of variety acts in general. Obviously I like comedians and musical acts. But I do also like watching dance groups and some of the more off the wall acts that come from a traditional circus background. I do still think being selected to be involved in the Royal Command performance should be a huge highlight and even a pinnacle of your career. I think it is something that should be earned, as I guess I am quite a traditionalist. And I am aware of the long and great history of it. I watched this year’s show, which I believe is the first one that Prince William and Princess Katherine have attended. It is nice to see that it is being passed on to the younger generation. There were some great acts on and some fantastic performances. The whole thing was marshalled brilliantly by Michael McIntyre as the host. The only thing that I wasn’t quite sure about was this. For me a few of the performers appeared to talk directly to the two Royals, which I thought was a no no. Sure a quick comment or joke at their expense in the right taste is good and traditional. But is seemed a bit weird when at times some appeared to be playing to the Royals and almost ignoring the audience. My view is you are there to perform for the audience in the presence of the Monarchy not the other way round. That said I did enjoy it and thought it was a good and very well balanced show. 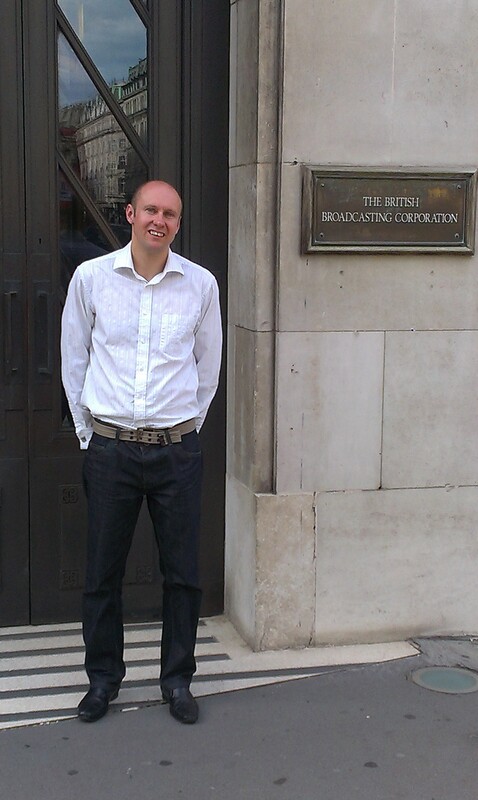 Last week I was back at BBC New Broadcasting House in London for another meeting about some potential work opportunities next year, Which is all very exciting and it will be amazing if it does come off. While I was there I did see a tanned and sun glasses wearing Scott Mills walk past me on the way to do his Radio One Show. There are four different lifts there and each one has a different BBC Radio station playing in them. It is a lottery which lift arrives first and therefore what your soundtrack will be. On this most recent visit I got the 1 Extra lift, which made for quite an upbeat journey up to my required floor. It is such a cool and yet such a busy building with lots happening there. It is also now where the One Show Studios are. And you can actually look into the set through the giant window, you can see behind the presenters on the TV. The day I was there, it would appear that they were having a big musical performance on the show because they were setting up a stage and piano in the outside area. In case you are interested the man who sat at the piano and played on the show was Jools Holland. They also had Cameron Diaz on to. You have no idea how much I now wished I had stayed up there to watch the show and may be try to meet her. I just think she is an amazing person! Who is very attractive. 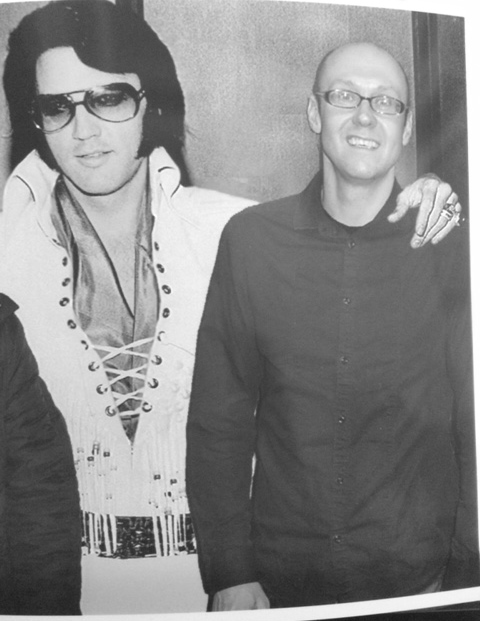 As I have mentioned before I am a big fan of Elvis Presley, both of the man and his music. He truly was an exceptional performer. Now my mum as a teenager had lots of his albums and his posters up on her wall. So it is fair to say that she is also a big admirer of his. 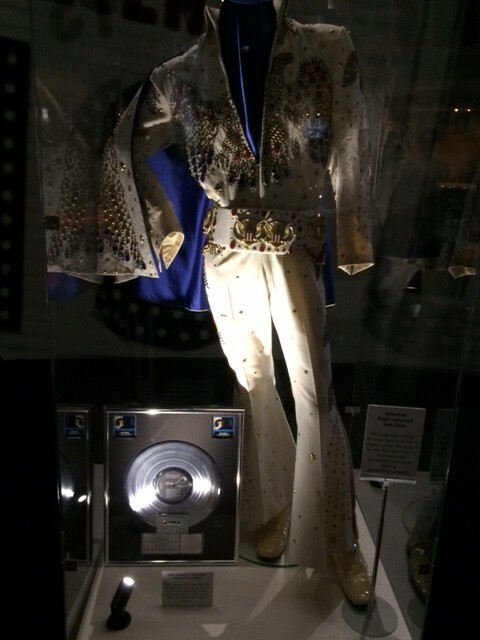 So yesterday me and her went along to the brand new Elvis Exhibition at the 02 in London. It features over three hundred different items, which have been loaned from the King’s Graceland Estate. The display charts his life right from his birth all the way through to the Las Vegas years. 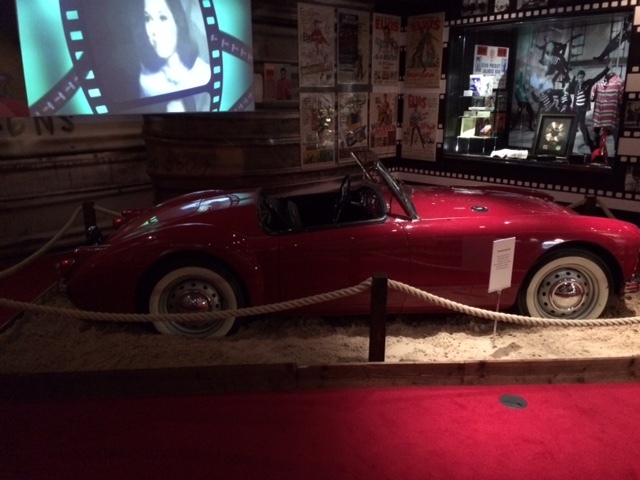 With lots of very personal items including his actual Birth Certificate, some of his army uniforms, original recordings and even a couple of the cars that he actually owned. It was both brilliant and amazing to see all these stunning things together in one place. I thought I knew a lot about him and his life but I learned plenty of new things about him, including what a well respected soldier his was judging by his discharge letter. And also how good his manager the Colonel was at supplying merchandise and making extra money on the side. Even to the point where as well as making and selling I love Elvis badges they also produced some I hate Elvis badges. Genius, why limit your potential market, when you can just please everyone. My favourite pieces on show, were the actual American Eagle style white jumpsuit that Elvis wore for the Aloha from Hawaii shows. Some of his other amazing jackets and coats that he had. And finally the massive TCB Ring that his wife Priscilla bought him. It is completely stunning. TCB stands for Taking Care of Business. Which was a kind of motto for his personal and professional life that he adopted. It was something which a select group of musicians and friends were included. Taken in to this kind of inner circle. It made sure people worked hard, got paid and got on with each other. It was his way of making sure everything was going well and everyone was looked after. And there was even a special TCB logo designed. Which was used on lots of different jewellery pieces that he and his friends used to wear. 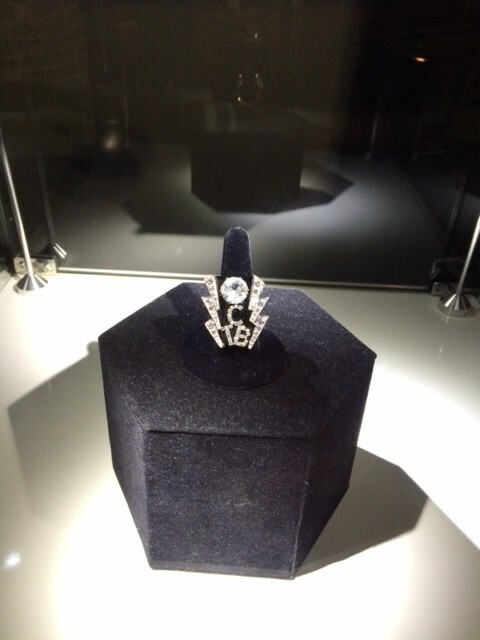 Although the ring he had, has to be the most spectacular item in that collection. The exhibition is on at the O2 in London until next August and if you have any interest at all in Elvis Presley or just the world of music in general it is a must see event. This is the first and possibly only time so many of these actual original items will be here in England. As you walk around you hear lots of the great man’s music and see lots of clips of him in action. Plus you can get yourself some fun photos at the end. Me and my mum had a great time there. It is another busy weekend for me, I have a Christmas Party at a hotel in London tonight and then on Sunday it is my families traditional pre Christmas Drinks gathering. With a schedule like that I am very pleased that I have already finished all of my Christmas Shopping. Which I did in my normal way, all in one day and all at one place. It simply involves just writing a list of everything I need to get. And then going to a shopping centre to buy it all in one go, it works every time. I am planning to have a fairly quiet family Christmas with a traditional dinner, lots of chocolate and cheese. And may be even a couple of drinks. Whatever you are doing over the festive period have a fantastic time. I hope you have been very good this year and that Father Christmas brings you what you want on the big day. Have a very Happy Christmas! I will catch up with you in a couple of weeks, in the New Year. 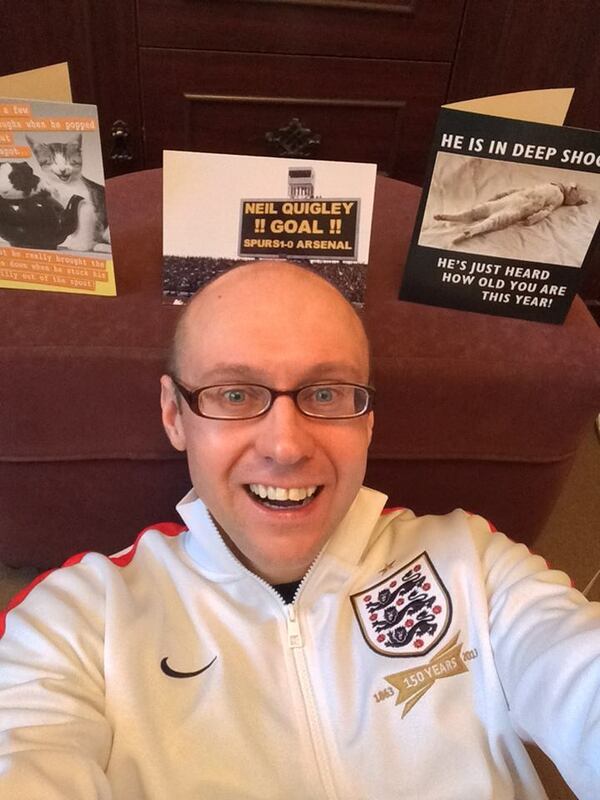 Have fun, Cheers Neil. Hi there, how are you doing? I hope you have had a good couple of weeks. Mine have as ever been very busy with lots going on. Last time we spoke I mentioned the big women’s International Football Match that was taking place at Wembley between England and Germany. And I was saying that a player who I knew would be part of the BBC’s coverage of it. So it was lovely to bump into Ellen White at the Stadium a couple of days after the game. And to have a very quick chat with her. Her recovery from injury is going well .She told me she should be back playing in a couple of months. Also congratulations are in order as she got married last weekend to. So I send my best wishes to her and her new husband. I would like to say a big thank you to the team at the BBC World Service, who let me spend a brilliant day watching them in action the other week. I do happen to know a couple of people who work there. And it was through one of them that I managed to set this great experience up. 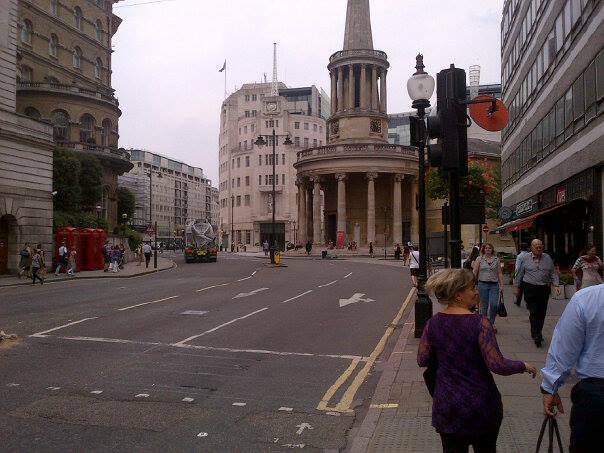 They are based in BBC New Broadcasting House which is at the top of Regent Street right in the heart of London. 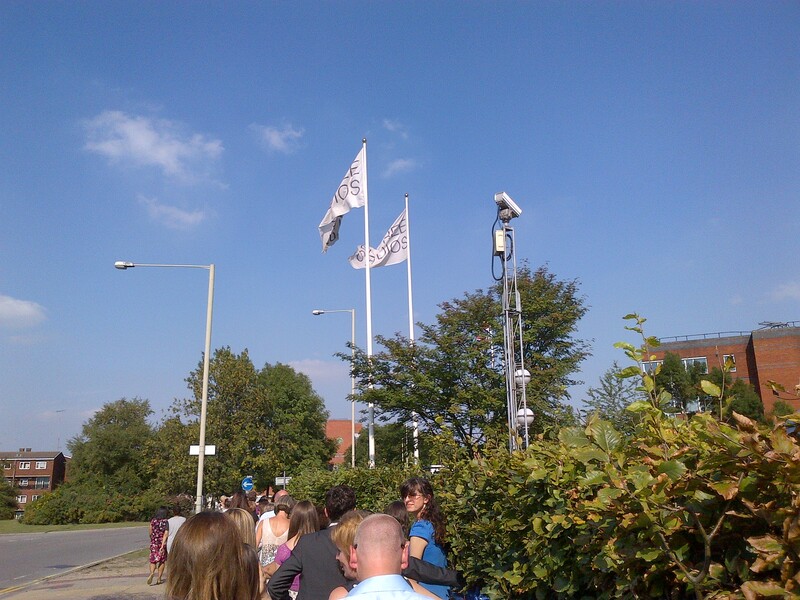 It is also where the TV News, The One Show, Radio One, Radio One Extra, Radio 3 and Radio 4 all come from. It is a beautiful building both inside and out. I have to say the studios and equipment there are out of this world. Being in the radio studios there is like being on the bridge of the Starship Enterprise. I was there to sit in and watch the Studio Managers in action on several different shows across the network. These included News Hour, The Newsroom and Outside Source. All of which were intriguing and fascinating to watch live from the studio. While they were being presented, produced and broadcast by a host of exceptional media professionals. 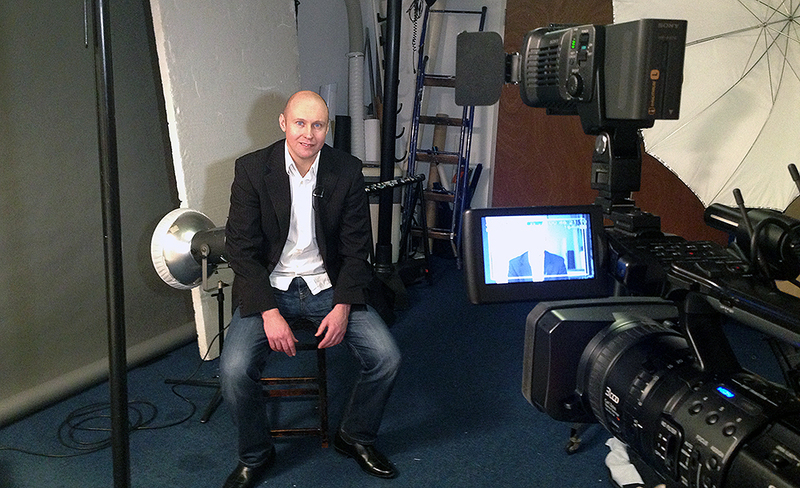 It was a very enjoyable day moving from studio to studio and seeing how it all works. From the English Language programmes to some of the other many different language services the BBC World Service also provides. 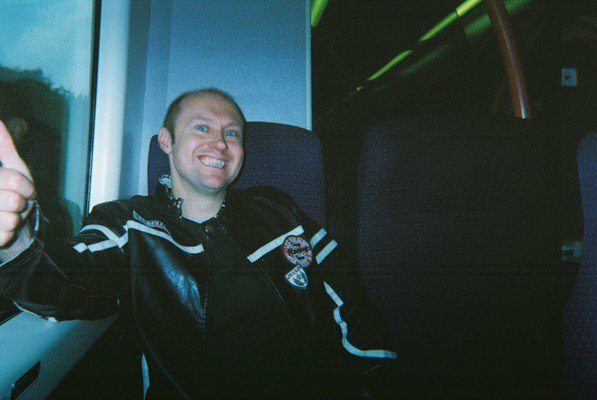 Once I had finished at the World Service at the BBC. I then just went next door to the BBC Radio Theatre to watch a recording of the Radio 4 programme Dilemma hosted by the fantastic Sue Perkins. 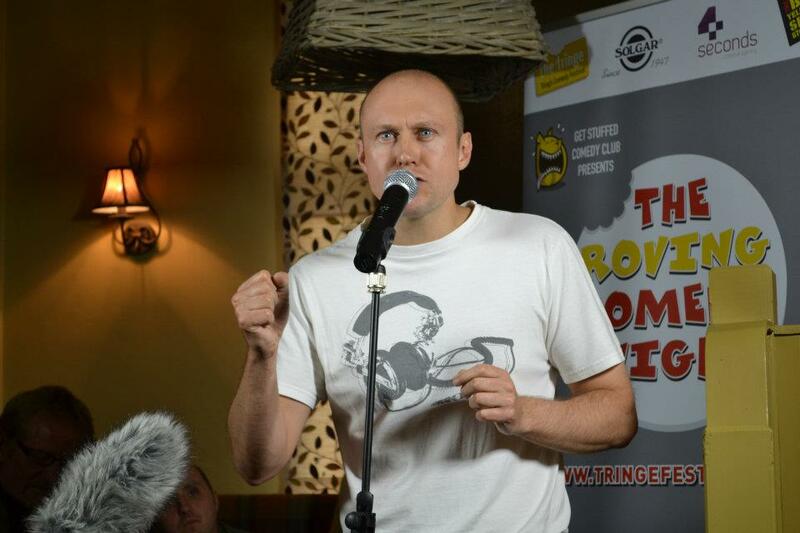 Before the show had even started we got a bonus treat, with a brief appearance from Tim Vine. All through December Radio 4 are playing out ninety second Christmas Cracker clips from different comedians. They were trying to record these in front of an audience. And as it is difficult to get an audience to come and see something that lasts less than two minutes. They were hijacking other shows to do this. It was different, fun, quirky and involved a guitar. That is all I am saying as I do not want to give to much away. Dilemma itself was very good. The guests on the panel included the brilliant Sarah Millican and former Blue Peter presenter Janet Ellis. As a five year old child I actually got Janet’s autograph, when we saw her and a very young Sophie at a cinema in Richmond. We were all there to see the same film which was a double bill of Mickey’s Christmas Carol and The Jungle Book. Just in case you are interested. I do still have the autograph. I then interviewed her about twenty-five years later on the radio and asked about the previous meeting. Which for the record she didn’t remember but in her defence it was a much bigger deal to me than it was to her at that time. She was very good and amusing on the show. It is always a very pleasant way to spend the evening watching a radio comedy recording in the Radio Theatre, as far as I am concerned. 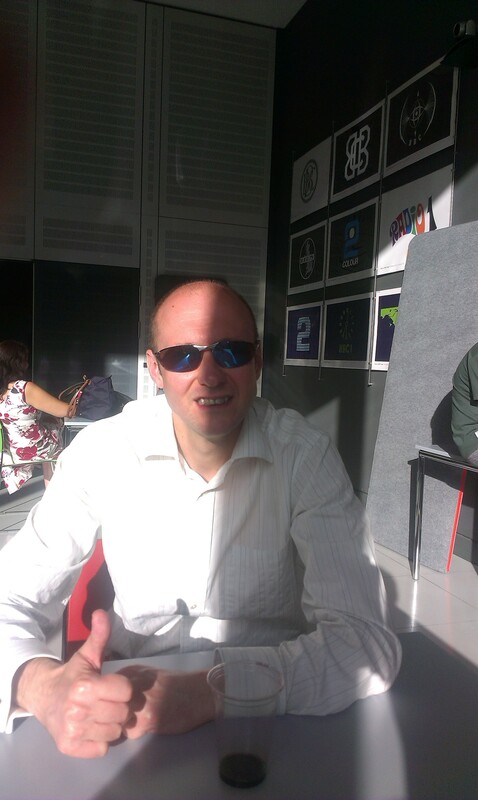 I even love just hanging around in the BBC Cafe waiting to go in beforehand. The other month I went to see my friend Mike Sterling perform in a Stars of The West End concert in Sloane Square. Last week we managed to catch up in London for a few drinks and a nice bite to eat. Firstly we found a nice roof top bar in a hotel on Regent Street to have a quick drink in before food. It was a place that from the front you would never have actually guest how good the bar and views would be at the top of it. From there we then went and had something to eat right in the centre of the West End. With Mike having spent so much time in musicals in London. He knows the area pretty well to say the least. So he suggested a nice burger restaurant that he knew just off of Leicester Square. It was called Byron Burger and the food and the staff were excellent. Most importantly the company was good. It was fascinating finding out more about his time starring in both Les Miserables and Phantom of The Opera. And getting a real insight in to what the life of a West End actor is actually like. And to be honest on the whole it sounded like great fun. A couple of weekends ago I took a trip up to Sheffield to surprise an old friend of mine. It was somebody who I met when I started doing hospital radio at Stoke Mandeville Hospital twenty years ago. When I joined I was put on his show and we became good mates, doing countless discos together over the years. About five years ago he then moved back to the Yorkshire area, where he was originally from. You know what it is like when you keep meaning to visit people but the time just goes and it never quite happens. But I was contacted by an employee of his saying they were organising a surprise 60th Birthday Party for him. Luckily it happened to be on a rare free weekend so I was able to go. I booked a hotel and took the train up. Then the employee who was arranging it very kindly agreed to collect me from my hotel and take me to the do. He had absolutely no idea I was coming. When I arrived because there were already quite a few people there and because I walked in with the girl who works for him. He didn’t really clock me at first. He just thought I was with her. Then the penny finally dropped. And I believe he was happy to see me. It was a really good fun night and the birthday boy seemed to enjoy himself. I then met him and his wife for tea and a further catch up the following morning before getting my train home. It was really great to see everyone and lovely to catch up with a good mate. As a lot of my friends are performers it means I can often have an entertaining night out when catching up with people. And this was very much the case the other Sunday. 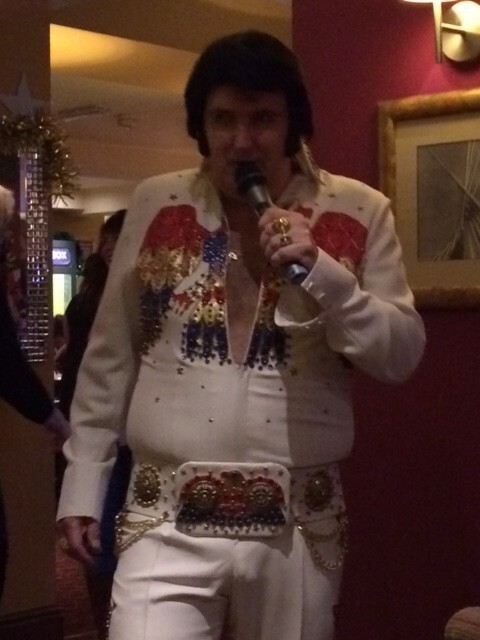 When I went to a pub in Aylesbury to watch my mate Alvin Printwhistle perform his Elvis Presley Tribute. I have seen him impersonate the king of rock and roll pretty much all over the country. In many different sized shows. Including a show with a full band and brass section at The Palace Theatre in London’s West End. He is extremely good and brings a lot of humour to his appearances. So they are always lots of fun. His repertoire of Elvis songs is huge, so he often performs different ones at different shows. At the latest one I saw the first part featured songs he sang in the movies and the second part was a full on Elvis in Vegas set complete with trademark white jumpsuit. It was great to have a quick chat to him before the show. He is a huge Elvis fan himself and clearly loves singing the songs. He is pretty much constantly gigging so do keep your eyes open and if you get the chance do go along and see him in action. 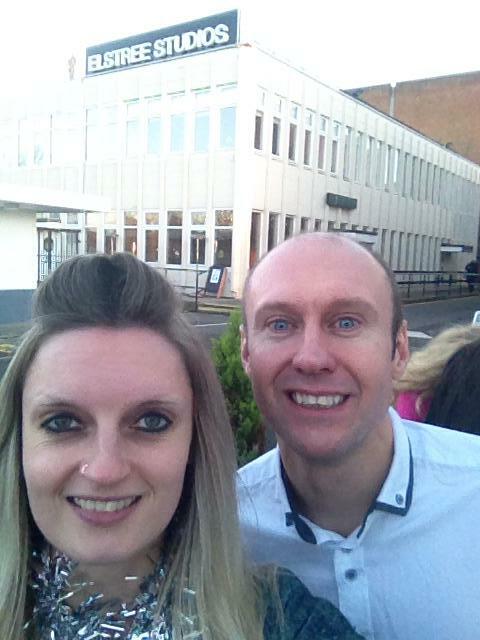 I was back at the Elstree Studios last Tuesday to watch an episode of A League of Their Own being recorded. The Sky One show is now into its ninth series. They filmed the whole series during the last seven days. And it is due to hit our television screens early next year. The one I saw featured tennis player Heather Watson, former Dutch footballer Patrick Kluivert and South African comedian Trevor Noah. As well of course as the regulars, host James Corden and panellists Jamie Redknapp, Freddie Flintoff and Jack Whitehall. It was brilliant fun everyone was on top form. Owing to the fact that James Corden is also someone who grew up in Buckinghamshire. I have always been supportive of his career and most importantly found him very entertaining. The show is perfect for him and gives him plenty of scope to mess around and have some fun. I was once in the same pub as Jack Whitehall in London. He was out with his mates and seemed very chilled, low key and nice. I have always quite liked him but after seeing him live in that environment. I can confirm he is hilarious. His jokes and general banter really made the show. To be fair everyone who was there contributed to the end product and all played their part. Without giving too much away we saw three world records broken and two amazing team challenges. We may well have found a new star in the form of one of the official Guinness World Record adjudicators. We had some great acting skills displayed by both Jamie and Freddie. Plus we had a right good old laugh in the process. As ever with TV recordings a lot more happens than will ever be able appear on screen but it was such a good night I wish the team editing the episode the best of luck in getting it down to around one hour. I was around the Covent Garden area of London one evening recently when I suddenly spotted a television camera with a big bright light on come out of the Hospital Club. So curious to find what was going on I stopped to watch and spotted none other than Johnny Vegas in front of the lens. They obviously wanted to mock up him arriving at the venue. They sent him across the road to start the piece and literally as soon as he stepped off the kerb a car flashed past and was inches away from running him over. Fair play to him he styled it out perfectly and just kept talking straight into the camera, as if it was all meant to happen. And it was all part of the plan. He then disappeared back inside and I moved on. I am usually rubbish at spotting random celebrity’s on the street. Mind you it does make it a little bit easier when they do have a large camera pointing at them. When I was working at Ivel fm in Yeovil I had the pleasure and the honour of performing the official opening of a new wedding shop in Ilminster called Prima Moda Brides. This did involve making a very short speech and then actually cutting a ribbon with a pair of scissors. That shop is still going strong and has recently celebrated its tenth birthday. So if you are starting a new business and need someone for the opening. Do keep me in mind. I have quite a good record of being a good luck charm in these situations. 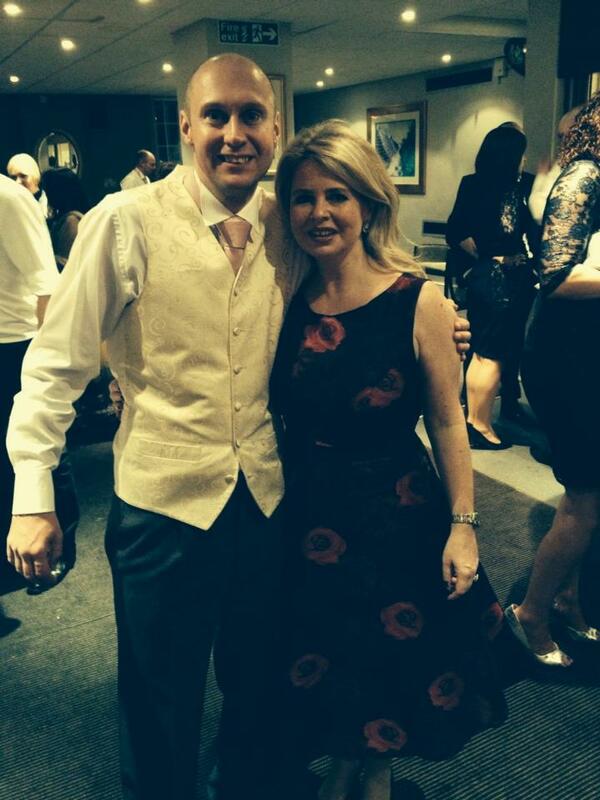 All the best to the lovely Jean and the rest of the team at Prima Moda Brides. I grew up watching Top Of The Pops every week when I was a kid. I always wanted to be in the audience for it but never got the opportunity. I thought the chance of doing that had passed me by when the show was cancelled by the BBC. But they do still have Christmas and New Year versions of the show. Where they look back at all the big hits of the last twelve months. They are recording both of these shows tomorrow (Sunday). And I am going along to see them. I am very excited to finally get to be in the that studio to see this iconic show being filmed. I have no idea which acts will be there but with it being a review of the year I will be a bit surprised if there are not some huge bands and singers there. I will tell you who was there, when we speak next. I have worked most of the New Year Eve’s for the last fifteen years. And once again this year is no exception. I am looking forward to getting dressed up in my bow tie and dinner jacket to perform the disco at the Ellesborough Golf Club this New Year’s Eve. It will be great fun and I am fired up and ready to get the party started. Bring it on. This coming week it is one of the biggest events of the year..My birthday..it’s on the 10th December.. just in case you wanted to send me a card or may be even a present. Have fun and we will catch up again in a couple of weeks. Cheers Neil.